I saw this car and fell in love. 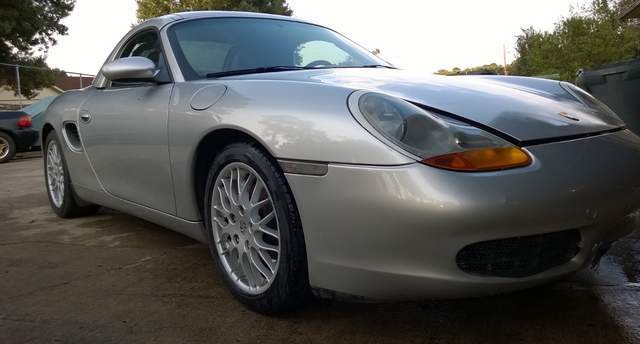 1999 Base, Red Leather Interior, Arctic Silver, factory hardtop, ...and totaled in a front end collision. I figured worst case, I'd keep the top and part most of the rest. I just had it delivered tonight and started my PPI (post purchase inspection). Looks like the PO took very good care of it and the damage is a lot less than I had assumed. Started right up and purred (shut her back down before all the distilled water ran out the busted radiator) Pretty sure it's going to be my DD soon. Looks sharp. The damage doesn't look too bad. I have a 4 spoke airbag if you go that route. PM me for details if you want it. I'll let it go cheap. 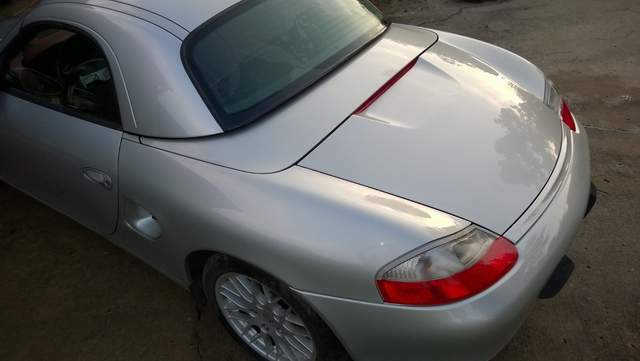 I love projects and I love Arctic Silver/Boxster Red - you've got a jewel! 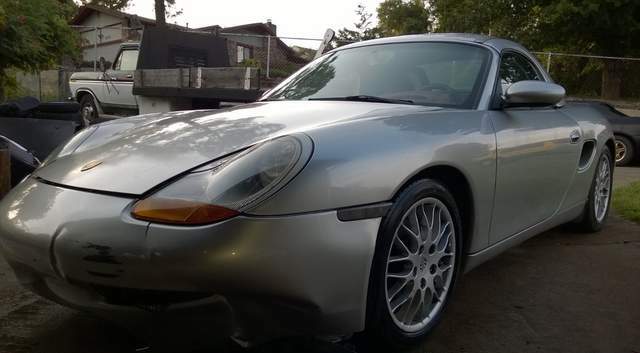 Great looking boxster and a nice project! Do you mind revealing what you paid? That looks like an easy fix. I have the exact same car, except for the wheels and those fluffy looking pillow things coming out of the dash and steering wheel. 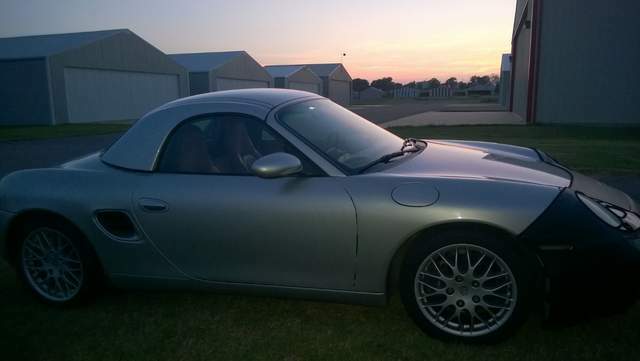 Arctic Silver, red interior, and hardtop FTW!! Love it, especially the hardtop on. I have a very similar vehicle, except my interior is black. Thanks for the comments. It is my favorite color combo for sure. Price + fees was a bit under $4k. Fees were very high. I wanted the car Badly and had to find a way to limit myself from spending waaay too much. 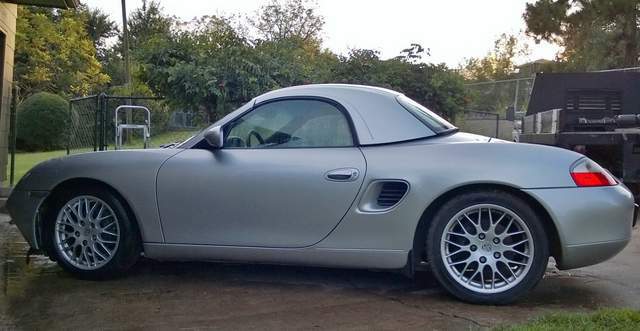 When I bid on it, I wasn't absolutely sure that it could be rebuilt, so I was thinking of recovering my cost by parts value: engine & transmission + wheels + hardtop + brakes + misc. Everything is going so well so far that I'm scared to jinx it by checking the oil filter. It does have a dealer sticker in the trunk, but no other docs. I'm going to see if I can track it to any service records next week. I've got the radiator/fan/shroud ordered. 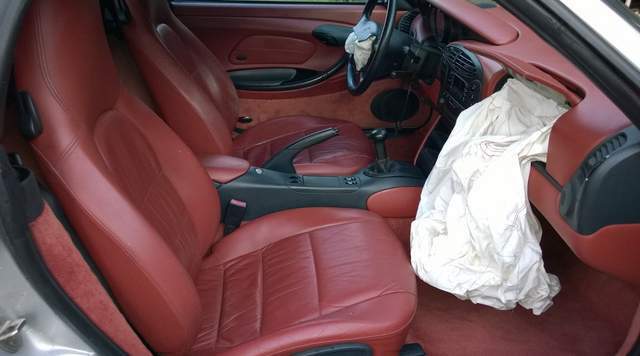 Looking for a red leather passenger side airbag. I may get an arctic silver bumper cover, or just repaint the new S- model bumper that I have on my black '99 and give it the old one back. Last edited by 78F350; 08-28-2015 at 02:20 PM. I didn't think you need a new passenger side airbag cover. I thought it was just a door on a hinge. I think the airbag is a separate unit that can be replaced using the old cover. You just have to take out 2 bolts up under the dash. The whole thing (airbag & cover) will come out towards the seats. There is a pin that holds the cover on the the rest of the airbag assembly. Slide the pin out and remove the cover. Get a new airbag, slide pin back thru cover and put it back into the dash. Last edited by tommy583; 08-28-2015 at 02:54 PM. Thanks Tommy. It is pretty easy to remove the cover. Mine is a bit scuffed at the top edge and will need to be bent back to the proper curve. With just a little work, it should be good as new. I strapped a bra on her to cover my (temporary) old black bumper and took her out for a proper wash.
Then a quick drive - still fearful that my temporary radiator fix will give out. Now she sits covered in my driveway 'till parts arrive. *Fender liner is off in the pics, keeping it off until I get the new radiator in. I was bidding on that car too. I'm glad to see that it was you that got it. It probably wouldn't have ended well for that car if I had the winning bid. 97-99 with a five speed are my favorite years to buy. Spec guys cannibalize them quick. Check for damage to the dash once you get the old airbag out. I would say half of the dashes get damaged when the right airbag goes off. I have a red leather dash if yours is damaged but I don't have the cover. Thanks. I suspected that you were watching that one, along with the local scrappers in OKC. Glad I saved it for some more good years on the road. I usually buy from Copart, but registered for IAA when I saw this one come up. antny tried to inspect it for me, but they wouldn't let him in without being registered. 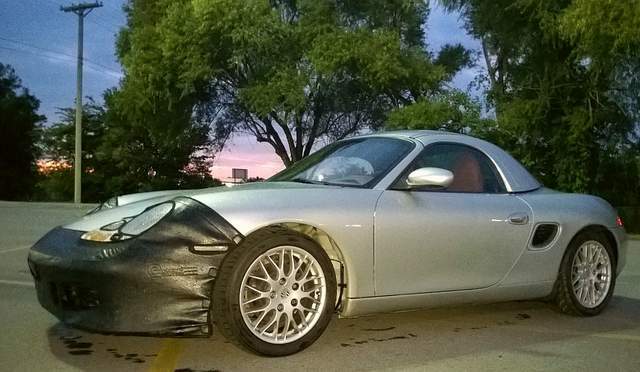 From the pics, I thought it had a cracked windshield and expected serious undercarriage damage. 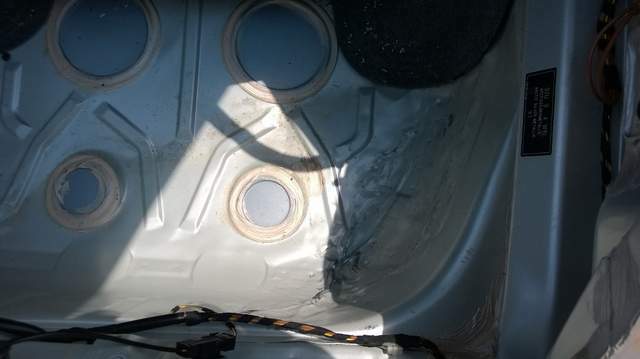 The worst body damage was the frunk pan and that is mostly pounded into shape now. Jon - I was at Oklahoma Foreign this morning. They have a complete red airbag assembly sitting in the black Boxster, south end of the east row of Boxsters. Call Gary (405) 799-0644. He'll know where it is. [QUOTE=78F350;463865]Thanks. I suspected that you were watching that one, along with the local scrappers in OKC. I've been meaning to ask you Ok guys up there about Oklahoma Foreign. I heard a rumor that the owner was retiring and none of his kids wanted the business. I've never once seen them buying a Porsche on IAA. I'm hoping to stop by there one of these days and check them out. My biggest competition is QualityPorscheParts for buying vehicles. No drag racing on the runway, but some of the taxiways were fair game. The coolant was yellow-green (tasted like Prestone), so I added another gallon of it with some distilled water. A full flush is on the calendar for October, then she gets the Porsche pink stuff (From Pelican). Got a great deal on a brand new bumper cover (03-04 style) which will arrive at the end of the week. Free shipping and a 20% coupon put it under $300. Happy to help. Oklahoma Foreign is a great resource - I'm going to hate when they close. Some of the most fun I have with these cars is my monthly trip there to dig through the yard. Lots of neat old junk.